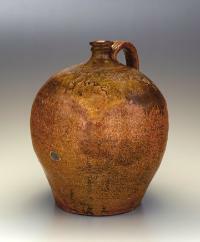 Dave made stoneware vessels from his early twenties until his mid-seventies, a span of over fifty years. Though they were always utilitarian in nature and made as part of his work as a slave, he often imbued them with a grace that transformed them into works of art. 25 5/8" tall. Lewis Miles, Dave's owner during his most productive period, often assigned him the task of making containers that would hold twenty-five, even thirty gallons or more. This was in response to the needs of the cotton planters of the area, who required such jars for storing the great quantities of food that fed their slaves. To produce ceramic containers such as these, Dave often used a technique that combined turning and coiling: He turned the lower half of the pot on the wheel, then coiled ropes of clay around the top of its walls to complete the vessel at the unusual diameter and height that was required. If the two men made a wager about it, Dave won, because more than 150 years later, the handle is in perfect condition! The formula for the handsome glaze that covers Dave's pots appears to have been the invention of Dr. Abner Landrum, uncle of Dave's first known owner, Harvey Drake. At his factory in Pottersville, just outside Edgefield Village, Dr. Landrum developed a glaze that was composed simply of wood ash, sand, and clay, components that were widely available to all. The wood ash acted as a flux to lower the melting point of the mixture; the clay helped bind the glaze to the pot so it wouldn't run off in firing; and silica in the sand produced a glassy surface when melted. Because wood ash is alkaline, this formulation is known today as the "alkaline glaze." 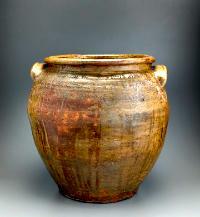 The look of the alkaline glaze varied depending on a number of factors, including ingredients that an individual potter might choose to add to the standard formula. Through long trial and error to develop working methods that he was comfortable with, a potter often inadvertently achieved a characteristic look for his ware. Pieces from Dave's youth at Pottersville were typically yellow-green or light gray-green in color; jars that he turned for other owners later in his life were dramatically different, with glaze colors ranging from dark olive green to brownish black. Information on this page is condensed from Carolina Clay: The Life and Legend of the Slave Potter, Dave by Leonard Todd (W.W. Norton, Fall 2008). The storage jar and the jug shown here, both made in 1858, are from private collections. The photographs, taken by Gavin Ashworth, are courtesy of Ceramics in America.